What's New On the 2017 Odyssey? 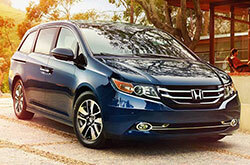 Those considering the 2017 Honda Odyssey, available now in Phoenix, will find that the best-selling minivan is once again offering a wide range of family-friendly features that will surely impress mom and dad drivers around the Valley. This model year, the 2017 Odyssey is getting a newly available acoustically treated windshield on its SE and EX-L trims, which helps to reduce noise within the van's cabin. Continue reading the rest of our 2017 Honda Odyssey review to find out more about this exceptional family minivan! There are six trim levels available on the 2017 Honda Odyssey: LX, EX, SE, EX-L, Touring and Touring Elite. Standard features on the Odyssey LX include rear privacy glass, a 60/40-split folding rear seat, a rearview camera, an 8-inch screen, Bluetooth connectivity, 17-inch steel wheels, a seven-speaker sound system, dual-zone air conditioning and power front seats. 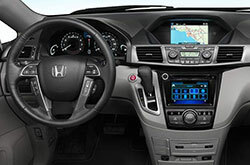 Adding to that, the Odyssey EX gets alloy wheels, keyless entry and ignition, automatic headlights, a 7-inch touchscreen with HondaLink, tri-zone automatic climate control and power-sliding side doors, while the SE comes with an integrated vacuum cleaner, a rear-seat entertainment system, satellite radio and a 115-volt power outlet. 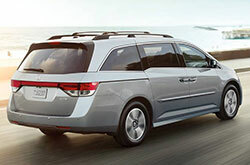 The next-level Odyssey EX-L adds even more luxury features to the minivan, such as a sunroof, leather seating, heated front seats, a power liftgate and a chilled storage box. 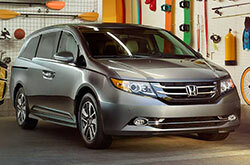 However, those seeking the most premium comfort and technological features should choose either the Odyssey Touring or Touring Elite, according to many 2017 Honda Odyssey reviews. They come with everything from 18-inch alloy wheels, a navigation system, and front and rear parking sensors (Touring) to xenon headlights, an upgraded entertainment system and a premium 12-speaker surround sound system (Touring Elite). The 2017 Honda Odyssey in Phoenix is powered by a 3.5-liter V6 powertrain that creates a very healthy 248 horsepower and 250 lb.-ft. of torque. A six-speed automatic transmission is paired to the V6, offering an agile driving feel and a nice bit of fuel economy. On top of that, the minivan's MacPherson Strut front suspension and its multi-link double wishbone rear suspension add to its impressive ride quality and ability to tow a total of 3,500 lbs., when properly equipped. 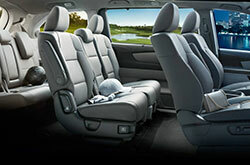 Safety is one of the most important areas that shoppers look at when buying a new family van. For that reason, Honda has supplied the 2017 Odyssey with a plethora of exceptional standard safety features. Features include antilock brakes, daytime running lights, brake assist, a multi-angle rearview camera, dual-stage front airbags, SmartVent front side airbags and a full LATCH system. Choose one of the higher trims and you'll add even more advanced safety equipment like Honda LaneWatch, blind-spot monitoring, lane departure warning and forward collision warning. To learn even more about the 2017 Honda Odyssey, visit us today at our convenient Bell Road location in Phoenix! If you want a new car near Phoenix, don't just look at the 2017 Kia Sedona, Nissan Quest, Toyota Sienna and the Chrysler Pacifica; also view the attractive 2017 Honda Odyssey. You may find that it is a definite match for you, with its sleek design and marvelous on-board technologies. Once you're wrapped up with our 2017 Honda Odyssey review and compare page, check out up-to-the-minute Honda OEM financing offers. We're a resident Honda auto retailer where you can find amazing financial incentives - not only for the Honda Odyssey, but also for other new and Certified Pre-Owned cars. 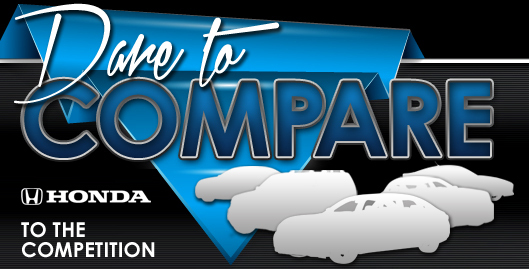 Our thoroughly researched review makes it less time consuming for you to access the information you need, and we hope it offers help when it comes to making a shrewd vehicle purchase. 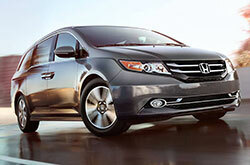 Stop by to be won over by a test drive at Bell Honda, where you can view the Honda Odyssey personally. Hoping for a chance to see it preceding your visit? That's no problem - viewing the enclosed video clip will give you a glance at its exterior from all sides.